This is probably the most obvious reason, but all students and educators would love the opportunity to say "We're the best." Many of us face problems justifying the marching band to the administration in terms of budget and time commitment. Having a nice, big trophy to display in the trophy case at the main entrance of the school always helps to gain administrative support. As we all work hard in this activity, it's always nice to get some sort of material recognition, such as a plaque, medal or trophy. There are certainly other reasons, and these are all absolutely valid; and of course, it does feel good to win, to be the best, to hear your group's name announced last in your classification. 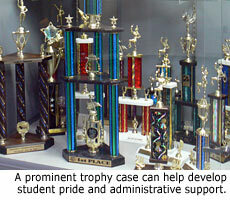 Additionally, competition can be a great motivator for some students to get them moving and enthusiastic for rehearsal. It is important to remember, however, that if competition is your sole purpose of the season, and your students know that, they can potentially be emotionally crushed if you do not meet your goal. I once knew a director whose band was in the position at one time to say they were the best band in the state; and technically, for that weekend, they were. This band competed at a state competition the weekend before championships and beat everyone there, including the band I was teaching at the time, and the band director made sure to tell everyone on Monday that they were in fact the best band in the state for that weekend. The students got incredibly excited and were quite confident that, since they were the best band in the state, they would surely win state championships the coming weekend. 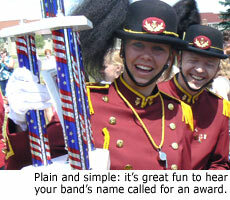 I checked some scores on the computer to find that there were numerous bands that were ranked ahead of them that had not competed that weekend, but were competing at group championships. I called him and mentioned that maybe he should remind his students of that fact, but he decided not to. The following weekend their band was beaten by the band I was currently teaching, as well as five other bands, and placed 7th. His students were crying, cursing, and felt that they had wasted an entire season because they did not win. 1. You have no control over another group. The reality of this sport is that you do, in fact, have absolutely no control over another group you compete with. You cannot control how often they practice, how hard they work, or the caliber show they perform. If they work harder and deserve to win, no one else has a right to take that away from them. This aspect could be an entire article in itself. Many times we find ourselves disagreeing with judges for many reasons, the main of which seems to be they never catch the good things in the show. As instructors in this field, many people have a hard time disconnecting themselves from their group during a performance and viewing it objectively. During rehearsal we always try to look for the mistakes to fix them, and during the performance we always try to look for the good things to make sure we get the score we deserve. Remember that judges are usually viewing your group for the first time, and they just love to find obvious mistakes to talk about. 3. Students base success of the season on winning alone. As shown in the story written above, students will base the success of the season solely on the competitive outcome of a competition, and not on other things like hard work, team work, progress or fun. Unfortunately, some circuits are more political than others. If you are competing in a circuit in which you normally do not, you may not be ranked as high as you would if you were well established in that particular organization. Competition should be talked about, but in my opinion, should never be the only reason for the season. The ultimate goal for the marching arts is to maximize the potential of your group and the show they have been given. Throughout that process, students will learn things that they will carry with them for the rest of their lives, such as teamwork, dedication, persistence, etc. Most importantly, what should be the concentration for the season is always giving 100% every minute of every day. In this case, no matter what the outcome of the season or competition is, your students will be content that there was absolutely nothing else they could have done. Winning is always fun, but again, in this sport there really is no defense. Your group will perform their show and have no influence whatsoever on anyone else. The focus of the season should be the journey to the destination; working hard, making friends, making fun memories, etc. Should you be rewarded for the performance of your group, then you will have another memory to add to the season. If not, your students will still be content with the journey they have taken together and the lessons they have learned, and will not have their emotions diminished by the lack of a trophy. The question in the title of this article asks how important competition really is; to answer, it is as important as you wish to make it. This article is simply meant to provide some information to help you make your choice. Rob Stein is founder and owner of Standing 'O' Marching Arts Specialists. He holds a master's degree in music education and a bachelor's degree in trumpet performance. His experience includes work with drum corps, marching bands, jazz bands, wind ensembles, pit orchestras and private lesson studios. The Standing O team specializes in customized original compositions, and also offers drill writing, color guard books, clinics, consultations and leadership training. The staff is trained in modern methods of musical and visual instruction, focusing on the development of body awareness, health and fitness, and overall musicianship. Text courtesy of Rob Stein. Photos by Marching.com.